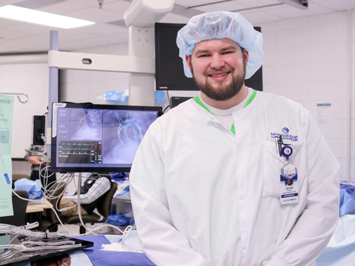 I chose the Cardiovascular Technology program because I wanted to help people and be in the medical field. Prior to enrolling at M State, I was enlisted with the U.S. Navy. I wanted to be involved in law enforcement and decided being part of the military police community was the best way to get experience. My enlistment ended, and I decided to take a different career path and apply at M State. I enjoy the smaller class sizes and friendly staff and teachers. Everyone is quick to help you achieve your goals and answer questions. I have never felt that there was a time I had a question or a problem that I couldn’t go to my instructor or a staff member about.